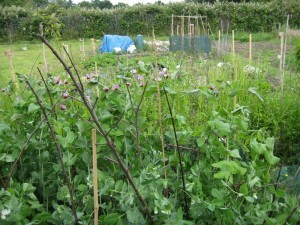 Allotment Plot 326 sits in the great field with many other allotment plots. It is part of a social system that gave humans a right to an allotment of land. 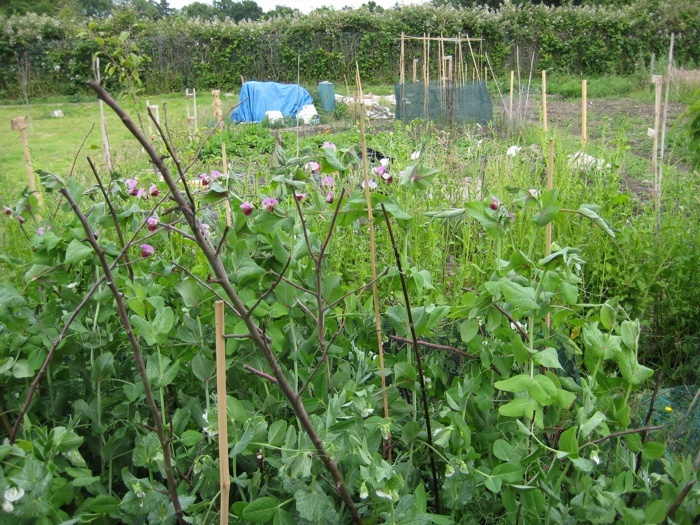 Desire for an allotment plot can be a utopian dream. 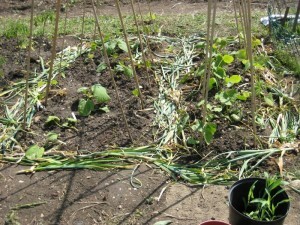 Reality of working an allotment or making the allotment succeed involves much hard effort. 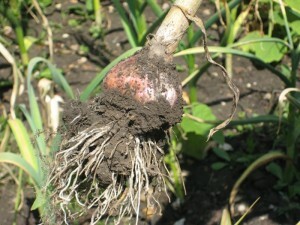 In order to make the allotment function it needs ground preparation. With any garden there can be much labour involved, but this individually depends on the nature of the garden and how it has been designed. 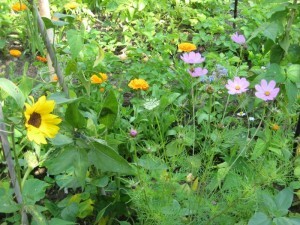 Some gardens need very little work, for other gardens the work is a never ending cycle. 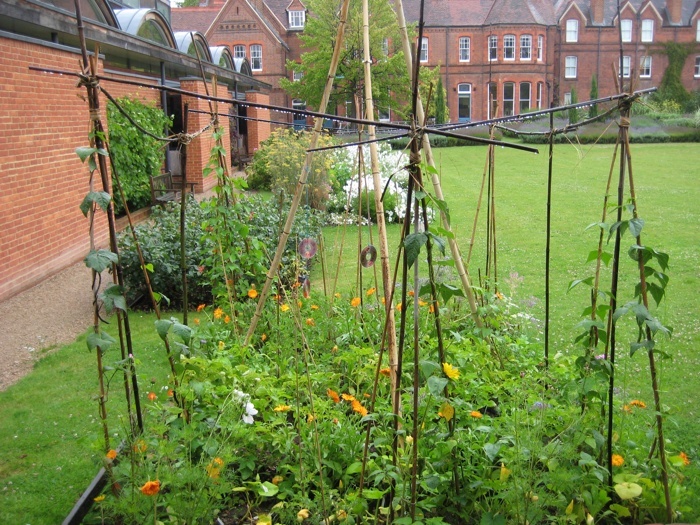 Gardens can bring pleasure to the humans that work them, but gardens can also bring sorrow, frustration and despair, (when plants are overwhelmed by conditions in the natural world). 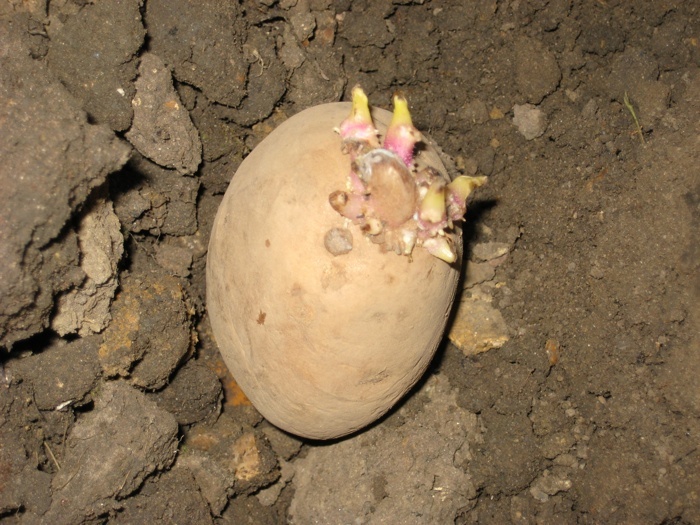 The ugliness of digging is in a sense an act of placing order on the natural world. That is not to say the natural world is one of chaos, but one that has its own order outside the human domain. 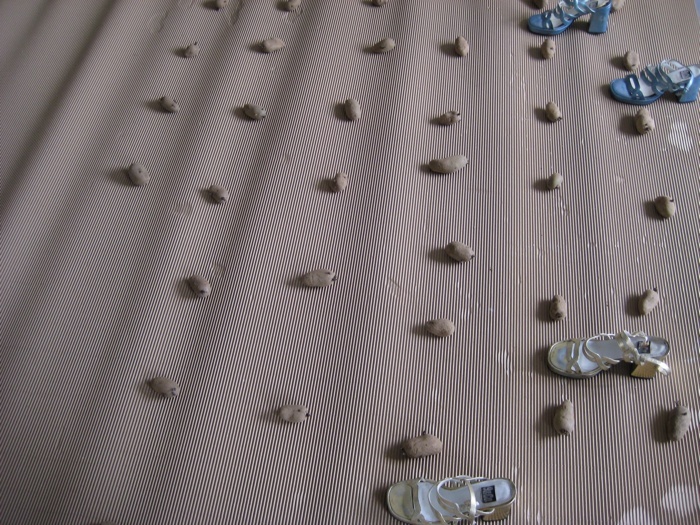 Ella Montt was standing in the studio amongst the chitting Charlotte Second Early Seed Potatoes that were spread in 30cm intervals across corrugated cardboard that simulated the Allotment Plot laid out across the floor. 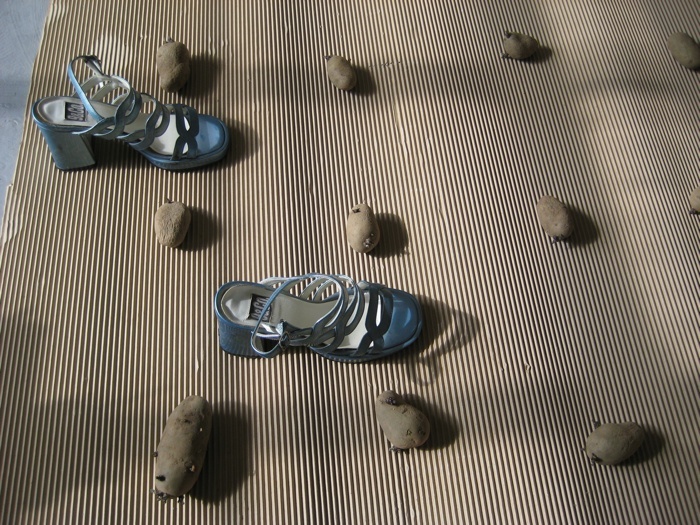 Ella Montt was wearing her metallic blue 4″ heeled shoes, she bent to pick up the Potatoes and gathered them in to a knitted plastic sack. 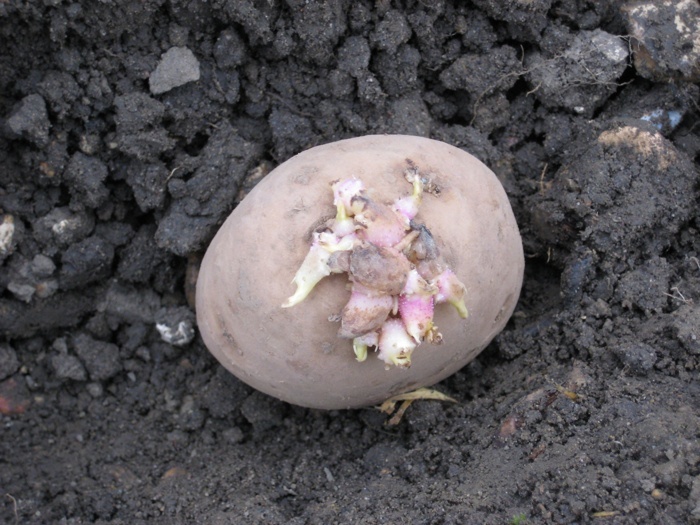 A similar sack of Sante Main Crop Seed Potatoes had been planted on the previous day (29 March 2011). 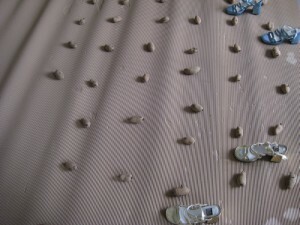 Each sack contained 40 Potatoes. Ella Montt removed her blue shoes and stepped in to her muddy earth trainers and then headed towards the Allotment to resume digging. 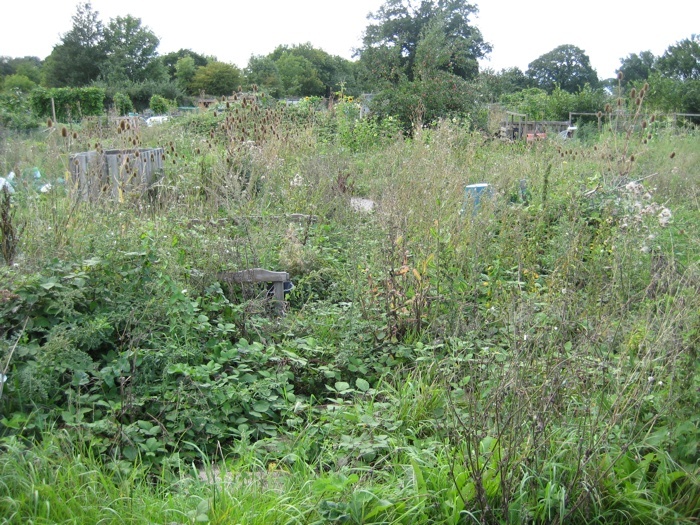 Ella Montt found the idea that an “Allotment” is classified in the UK as a Leisure Garden slightly misleading. Digging ground that was filled with bramble roots and hardening to concrete through lack of rain was not what Ella Montt would describe as “Leisure”. Thorpe’s report had endorsed this taxonomy. Digging vibrant soil that turns easily can be joyous but at that moment it was ugly work and hard labour. Perhaps Ella Montt lacked the muscle power, but it was nothing to do with her gender. The art of digging is not gender specific. 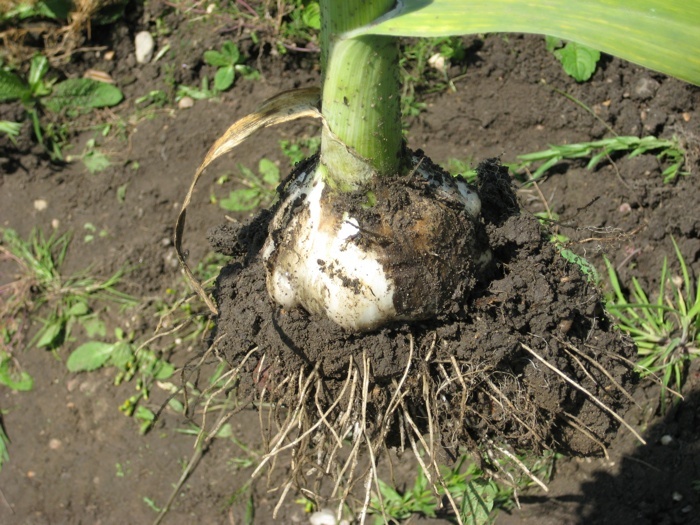 Digging had been easier when the soil was more moist a few weeks ago. To lighten Ella Montt’s mood, to break the tension of the act of digging, she employed the act of spontaneous dancing, (see the video evidence). Would Thorpe approve of dancing whilst digging to instigate Leisure? A slight rain shower earlier in the day had hardly penetrated the surface. 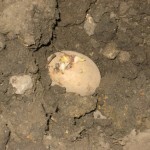 Below the surface soil it was almost rock solid. 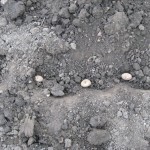 The Charlotte Potatoes were eventually planted. 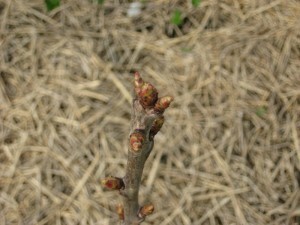 Meanwhile the fruit trees were starting to unfurl tight leaf buds. Ella Montt felt the feelings of panic setting in again, because the fence around Allotment Plot 326 is still not erected. The need for the fence was becoming more imperative. Not a need to protect the Potatoes from the hungry rabbits, but a need to protect any other plantings to follow from the hungry rabbits. 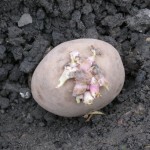 The Potatoes worst enemies could be frost, drought, flooding and blight, but not rabbits. 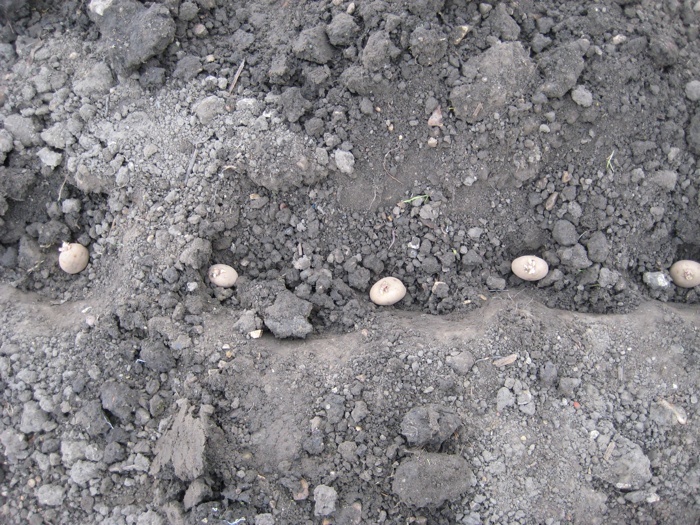 With the Potatoes planted, Ella Montt’s focus can now shift to the creation of the fence. A magpie landed on a nearby plot and steadily walked across newly planted soil, searching for, finding and then eating hidden seeds. 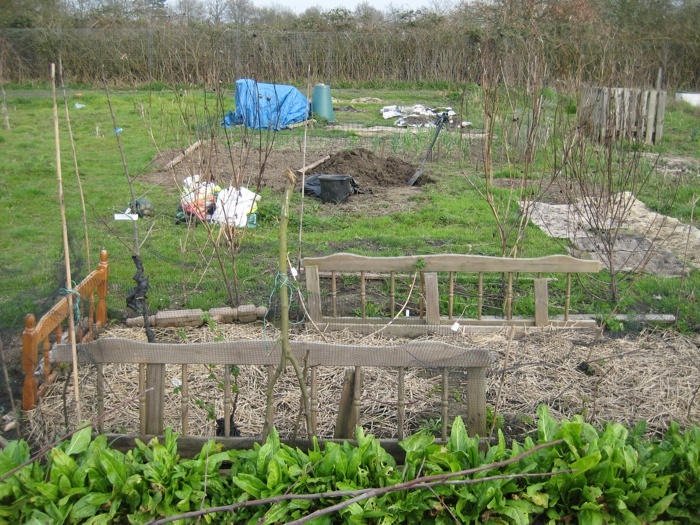 This entry was posted in Allotments, Digging, Leisure, Planting, Plot and tagged Allotments, Digging, Planting, Plot, Plot 326, Thorpe Report on March 31, 2011 by katecorder. 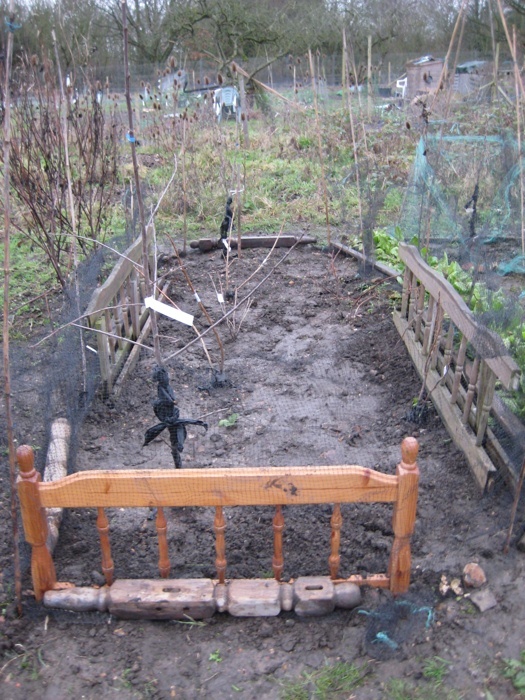 At Allotment Plot 326 on January 14th 2011, Ella Montt planted some fruit bushes and trees. The temperature on that day was almost balmy. 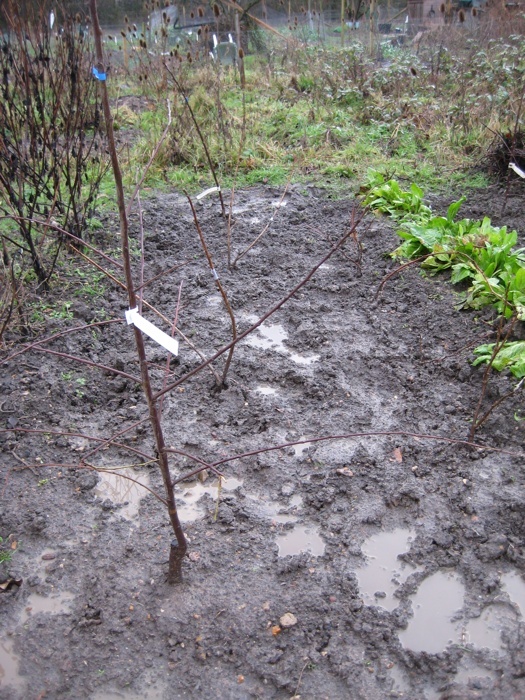 In the designated planting area the ground was dug to try to remove any bramble roots. Holes were then excavated and the roots of the trees and bushes were grounded and firmly covered with soil. 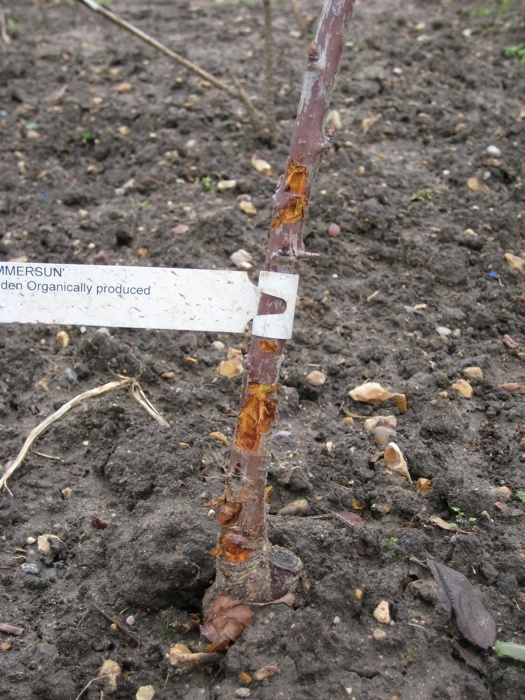 The trees planted were Apple Cevaal, Cherry Summer Sun, and Plum Victoria, all on small root stock. 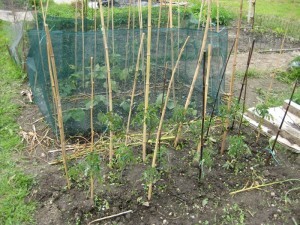 The bushes planted were 2 Jostaberry, 1 Gooseberry Pax and 1 Blackcurrant Ben Sarek. 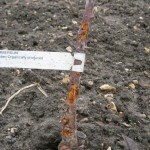 Also re-planted was a Strawberry Plant and some Raspberry Canes that had been found on the Plot. After several hours of labour, Ella Montt was hurrying to finish her work. The sky was darkening and a clap of thunder sounded over head. Then the rain came, falling heavily on the young trees, the newly cultivated soil and the worker Ella Montt. 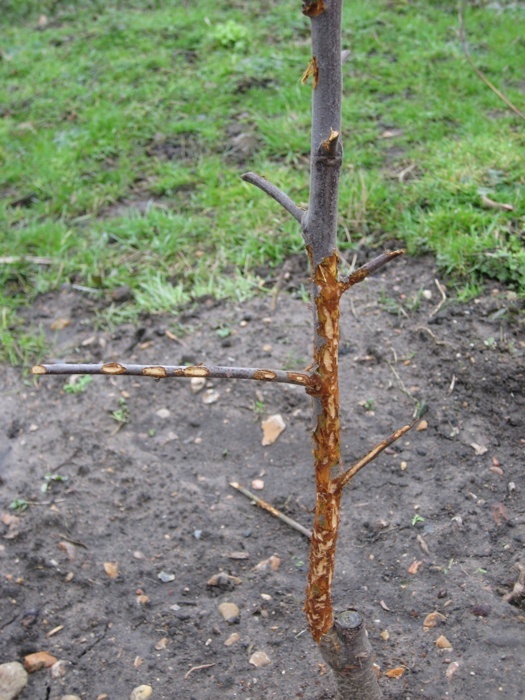 On the 25th January, Ella Montt returned to the Plot to find bark had been eaten from trees. 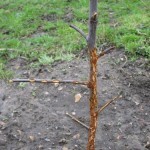 When the trees arrived they came with a warning that Rabbits may attack them by eating their bark. 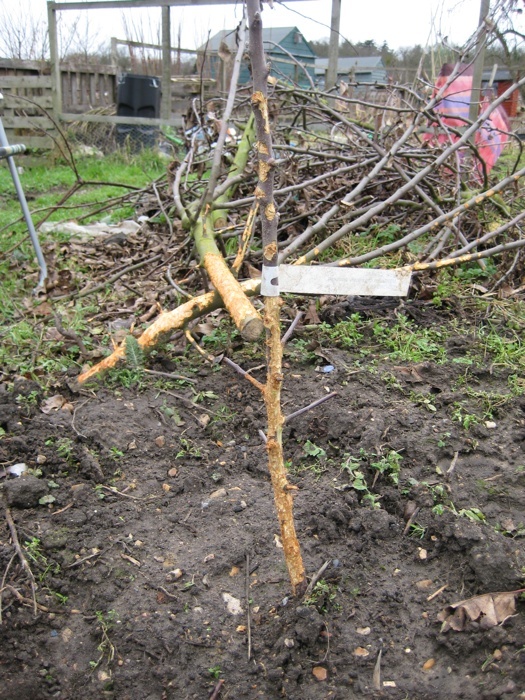 Ella had been too busy to return to the Plot before now and was sorry that she had neglected the trees. A bag of old netting sat in the Shed, Ella collected it and searched the Plot for anything she could use to prop the net up with. 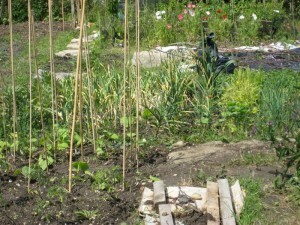 She found some old bamboo canes, sticks from the old Apple tree and pieces of wooden bed frame. With this assemblage of material Ella Montt created a barrier that she hoped the Rabbits could not invade. Ella wrapped biodegradable plastic around the damaged bark on the trees to protect them. 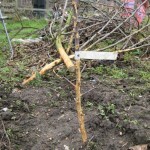 Ella Montt returned to the Plot on 28th January to check on the trees. It seemed so far there had been no new invaders. The rest of the Plot still needs to be dug over, brambles roots removed and fences put into place to try to protect the plants that Ella Montt wants to try to grow there as part of the Plot. It is very much an experimental growing area. 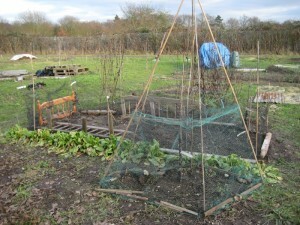 This entry was posted in Allotments, Plant, Planting, Plot and tagged Allotments, Fruit Bushes, Fruit Trees, Planting, Plot, Plot 326 on January 30, 2011 by katecorder. 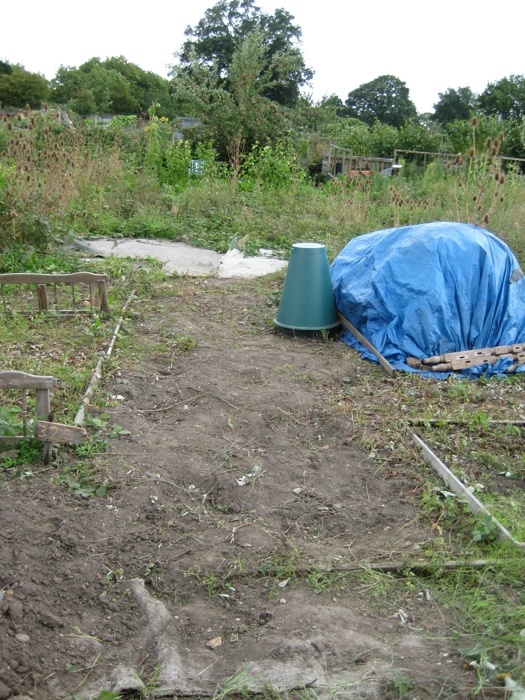 Plot 326 tenancy started on 24th August 2010. The key to the plot arrived in the mail on 27th August and the first visit to the new Plot took place on the 28th August, subsequent visits to the Plot have taken place since then and will continue on a regular basis. 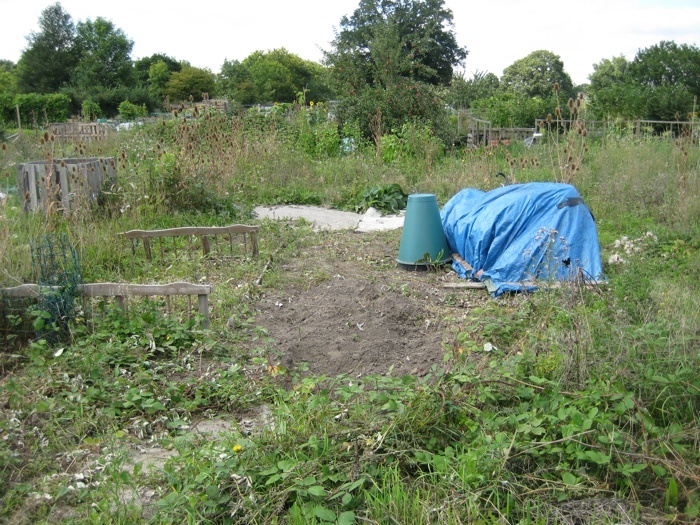 The whole Allotment site is extensive and the waiting list for this particular site at Bulmershe is long and now at the numerical figure of 88. When Ella Montt signed up to the waiting list in November 2010 the waiting list was half the number as it currently stands, this would suggest that there is a fairly active turnover of Plot holders, but it may also suggest that individual flux is a reality in society as a whole and that static living is not a common factor for many. 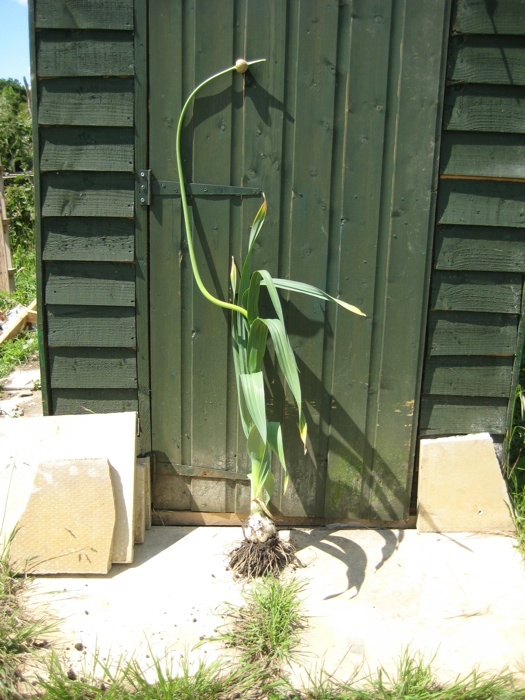 Gaining tenancy was and still is an exciting moment for Ella Montt who now became an Allotment Holder. 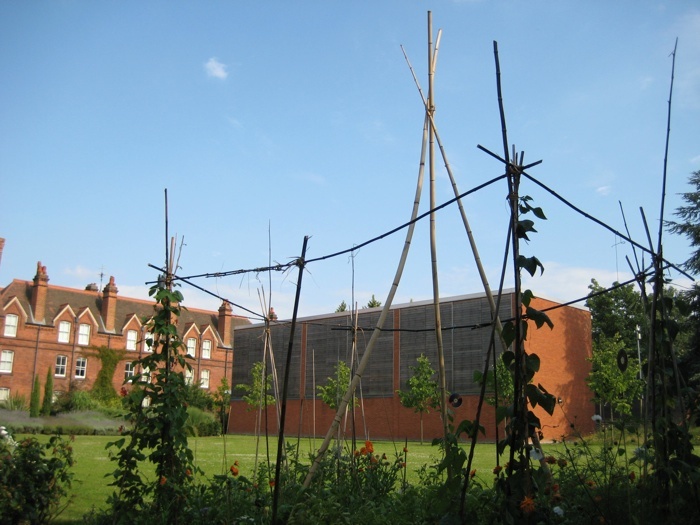 The experimental Plot at MERL will now have a research area not just in the historic garden at MERL, but Ella Montt would also become part of or linked in to Allotment History on a town site that has been in existence for many years, a space that has much history of its own. Ella Montt will share the people’s rights to growing space for food. 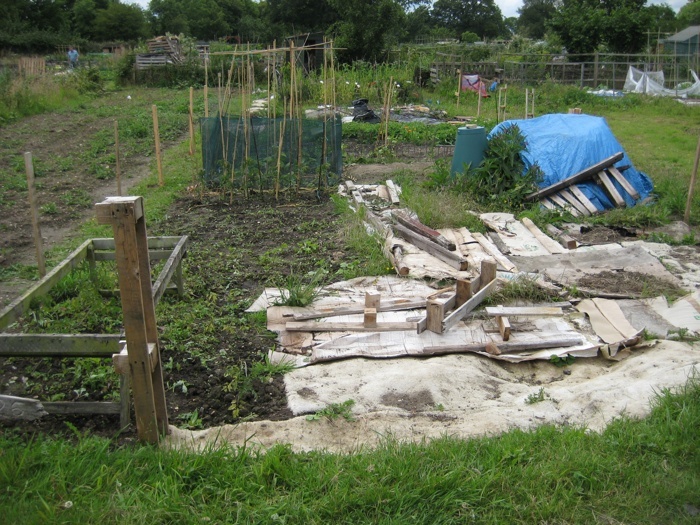 Allotments in the United Kingdom were originally set up for the working classes, poor or unemployed people when they were denied access to land through the Inclosure Acts. The parliamentary Acts were a gradual process from medieval times but the passing of these Acts accelerated around the 18th to 19th Century. The rich often appropriated Common Land that was once open to all and the people were denied access to growing space or to forage for fuel wood and food. A mass exodus from the rural areas at this time, because of lack of work and means of support coincided with industrial revolution, towns and cities began to grow rapidly, and space was needed as part of both the rural village and urban areas for the workers or unemployed to grow food for subsistence. 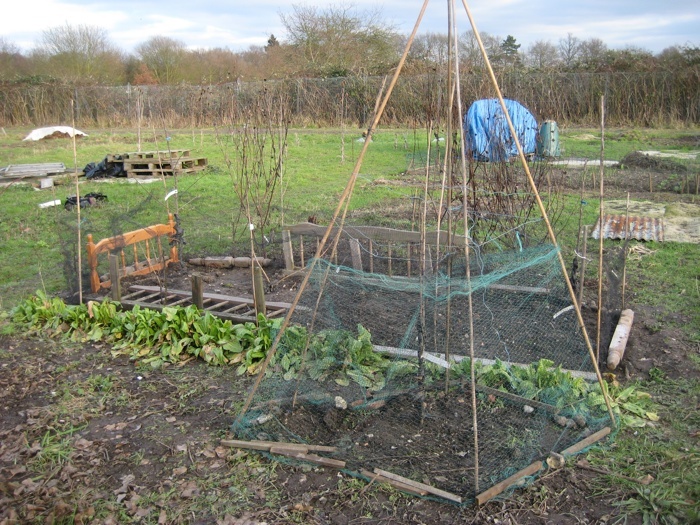 Various Allotment Acts were passed over many years to allow the right to land with in a given area. Much like strip farming of medieval days this land was divided up and rented to the Growers. During the 1914-18 War, because food was needed, the demographic of allotment holder grower changed to be not just the poor, but also anyone who was able to implement this action. 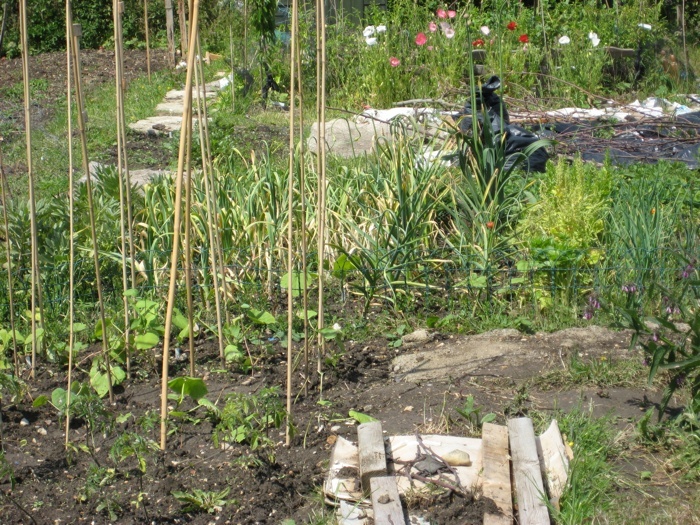 In WW2 1939-45 Allotment land was converted from any land, garden, or park space that could be made available. The need for food is universal, so this was a parallel affect in other countries affected by war at this time. 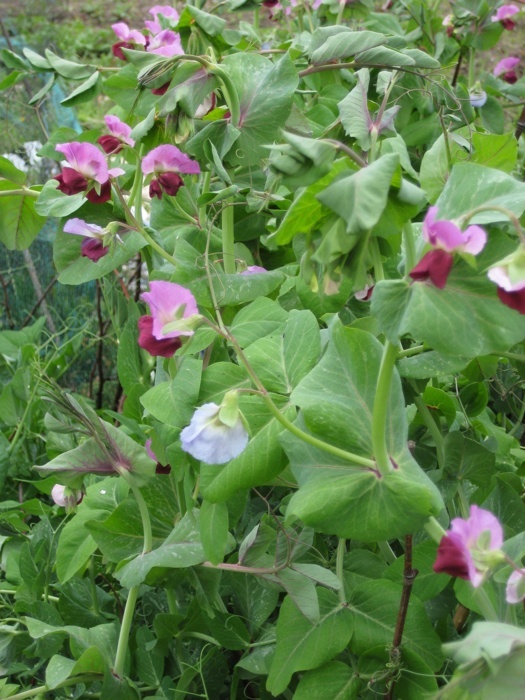 The popularity of access to Allotment space comes and goes. For some individuals they have asserted their right to this growing space for many years. 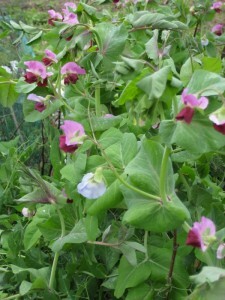 In recent years awareness that being able to grow ones own food can be beneficial in many ways. 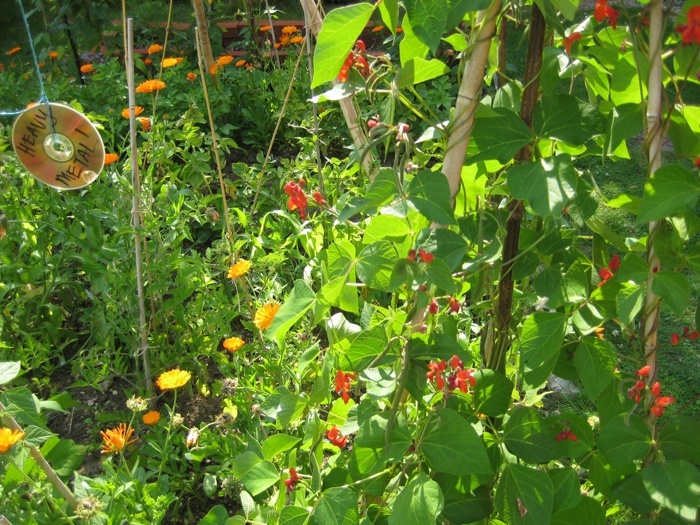 It is an enjoyable way to maintain health through outdoor activity, food can be grown without the use of pesticides or genetic modification, biodiversity and wildlife can be encouraged through companion planting, one can grow food without contributing to air miles, the food tastes better than anything bought from a supermarket, the food is fresher, one will know how it is grown, it can be an act that deflates the power of the supermarket through autonomy, but does not support individuals who are in business as Growers. 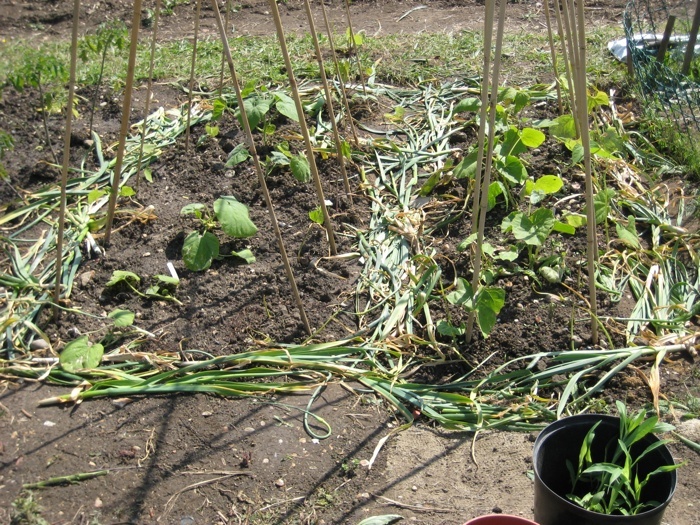 An Allotment site is a social space, in order to maintain an individual Plot and achieve vegetable self-sufficiency it takes planning and labour. 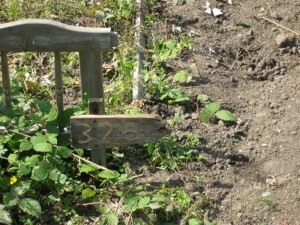 The first visit to Plot 326 was the start of a new adventure. 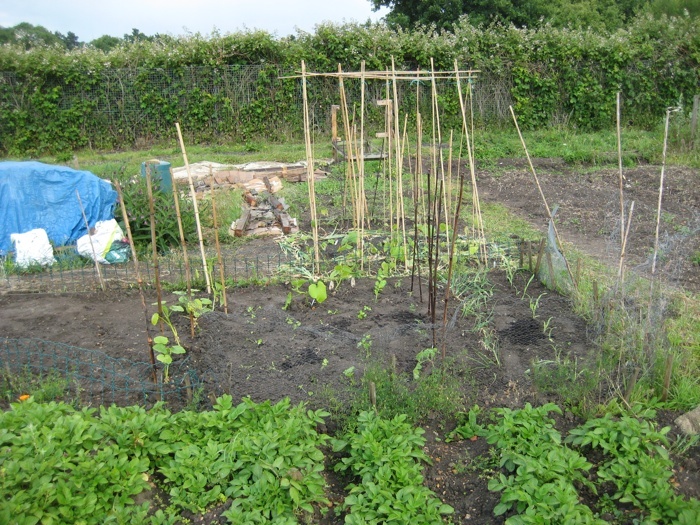 On entering the big iron gates a series of social interactions was initiated, including welcoming deposits of runner beans and over sized courgettes from various other Allotment Holders. 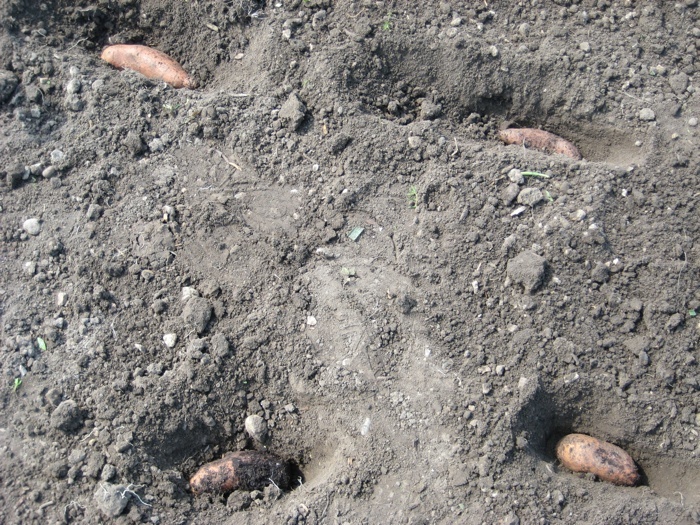 Ella Montt’s Plot was at the furthest end of the field site. A timely reminder was noted that panniers would be needed on the bike for transporting various items both to and from the Plot. 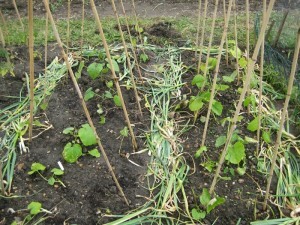 With assistance from a map of the Allotment space and another Allotment Holder the Plot‘s position was defined. 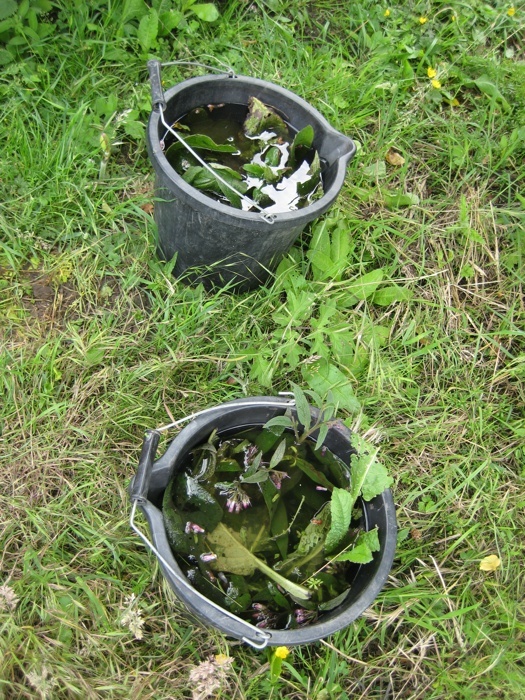 A survey of the new Plot discovered that it was cultivated in a small percentage area by the previous tenant, but the majority of the Plot space was covered in weed plants with bountiful seed heads and brambles. 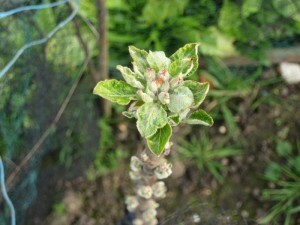 An Apple Tree is at one end of the Plot. The tree is over grown and in need of pruning with some of its boughs trailing onto the floor. When the tree was flowering in Spring it must have been covered in blossom, because now it is covered in Apples, which unfortunately, because of it being over grown and over capacity, means a lot of the Apples are being wasted on the ground. 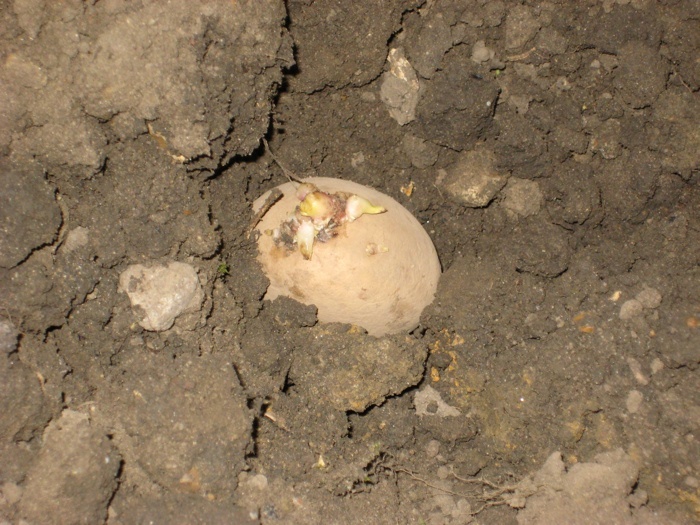 Some of the fruits have since been gathered but as yet it is too early for them to be ripe and because they are eating apples they are not fluffy when they are cooked, but they are usable for cooking. 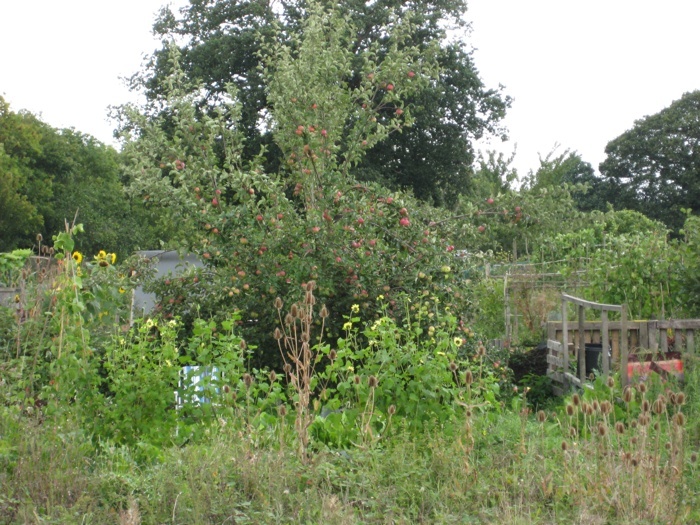 It was reported from the Allotment Holder at 328A that last year there was only one Apple on the tree and in October it was very tasty. 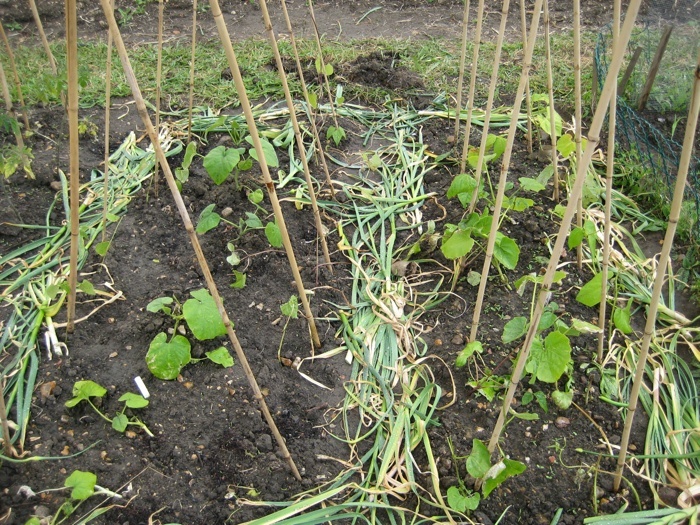 Working on the Allotment Plot has revealed the soil seems good, but the Plot is known to flood in the winter. 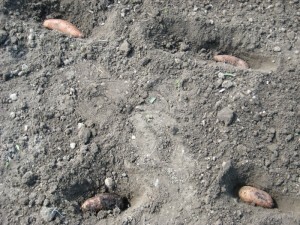 Gradually the Plot will be dug over, a choice was made not to rotovate it, because although rotovation would break up the soil quickly it would turn the seed heads and brambles under the soil, which will create even more work at a later date. The next few weeks will see more space clearing when time allows in preparation for over wintering vegetables and fruit planting. 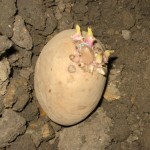 This entry was posted in Allotments, Artwork, Plot, Social Space and tagged Allotments, Art, History, Plot, Plot 326 on September 7, 2010 by katecorder.